Car hire at Malaga train station is the perfect option for those who arrive in Malaga by train and need a means of transport. From this website we will review the best websites for renting a car in Malaga, but at the railroad station. Malaga train station is situated right in the centre of the city. If you hire a car or book a transfer, they will pick you up at the station, and you won't have to worry about a thing, only of getting ready to enjoy your holidays. Malagacar.com is one of the most popular car rental websites in Malaga and they do offer pick-up service at the train station for those who arrive to Malaga by train and decide to rent a car. Malagacar offers pick-up service at the train station. Car hire at Malaga airport. High ratings on feedback sites. Enterprise Rent-A-Car is a company originally from the United States that can be found in the main airports and cities of the world. 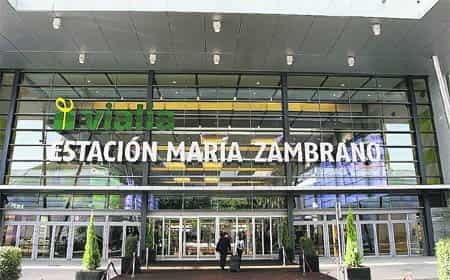 In Malaga you can find it in the Vialia Shopping Centre inside María Zambrano Station. Hertz is also available at the train station as well as at Malaga airport. Is it a good idea to hire a car in Malaga? Definitely, yes; unless you already have your own way of transport waiting for you...we could differentiate between those who plan to visit the entire province (who will of course need a car) and those who plan to just enjoy the beaches and the surroundings of their hotel or accommodation; for this kind of visitors there are economic options in which, just for having a way of transport to and from our hotel, it would already be cheaper than a taxi and it's worth it. A car will provide us the necessary freedom to discover and enjoy Malaga, for more information check our page about Maria Zambrano train station.